There are eight significant bridges in Vancouver, not counting the capilano suspension bridge and Lynn Canyon Suspension Bridge. Three cross the Fraser River, which borders Vancouver on the south, three cross False Creek and connect downtown Vancouver to the rest of the city, and two cross the Burrard Inlet and connect Vancouver to the North Shore. If you drive into Vancouver from the Peace Arch border crossing or from the Tsawwassen Ferry Terminal, you’ll cross the Fraser River on the Oak Street Bridge. If you fly into Vancouver International Airport, you’ll cross the Fraser River on the Arthur Laing Bridge on your way from the airport to downtown Vancouver. The Knight Street Bridge, which crosses the river east of the Oak Street Bridge, is the least significant bridge for visitors. If you drive into Vancouver, you’ll most likely get downtown by crossing the Granville Street Bridge. It’s the middle bridge of three that cross False Creek. The Burrard Street Bridge is west and the Cambie Street Bridge is east. The Granville Street Bridge spans not just False Creek. It also goes over Granville Island. To visit Granville Island watch for signs that tell you where to turn as you cross the bridge. To visit South Granville Street, with its twenty art galleries, designer boutiques and some of the best restaurants in Vancouver, just go straight after you cross the bridge and park around 6th Avenue. The distinctive Burrard Street Bridge (pictured left) will take you to Kitsilano, called Kits by locals, where you’ll find the Vancouver Museum, the H.R. MacMillan Space Centre, the Maritime Museum, Kitsilano beach and pool, great shopping and eating on 4th Avenue and West Broadway, and, at the western tip of Vancouver, the University of British Columbia. The Cambie Street Bridge is the best bridge to take if you want to shop for outdoor equipment at Mountain Equipment Co-op located on Broadway between Manitoba Street and Columbia Street or at one of the many other outdoor equipment stores located in the same area. The Lions Gate Bridge connects Vancouver to the North Shore. It is Vancouver’s most famous bridge. Like San Francisco’s Golden Gate Bridge, the Lions Gate Bridge is a suspension bridge, and both bridges were partially built at the old Dominion Bridge site in Burnaby, BC. The Golden Gate Bridge was completed in 1937 and the Lions Gate Bridge in 1938. 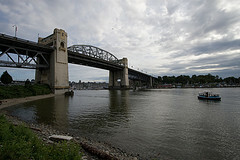 The other bridge to the North Shore, the Ironworkers Memorial, or the Second Narrows Bridge, was completed in 1960. It was given its name because of an accident that took the lives of 19 workers when part of the bridge collapsed during construction. If you want to ski at Mt Seymour, golf at Northlands Golf Course or Kayak in Deep Cove, the Ironworkers Memorial Bridge is the one to take.